← New Release – Christmas Star! The last three months, the hubby has been doing something a little different in our garden. I’ve wanted a raised bed garden for years, mainly because I knew I wouldn’t always be able to get down on my knees to plant. But also because our soil is almost pure clay, and difficult to get anything to grow lush and green and strong without overwatering. And in this time of drought in California, bigger water bills are NOT on the menu. Above is the newest “dirt coffin” as the hubby likes to call it. This is #3. The soil is a mix of our own dirt (that had been amended in other planting beds), soil for raised beds, steer manure, and vermiculite. Since it gets so hot where we are, and our back yard gets the setting sun, he decided we should situate the planters near the shade of the oleander (above photo, to the right). This bed gets the most sunshine. Beyond the bed, that black thing is our composter. All our green food waste and our coffee grinds go into the composter. 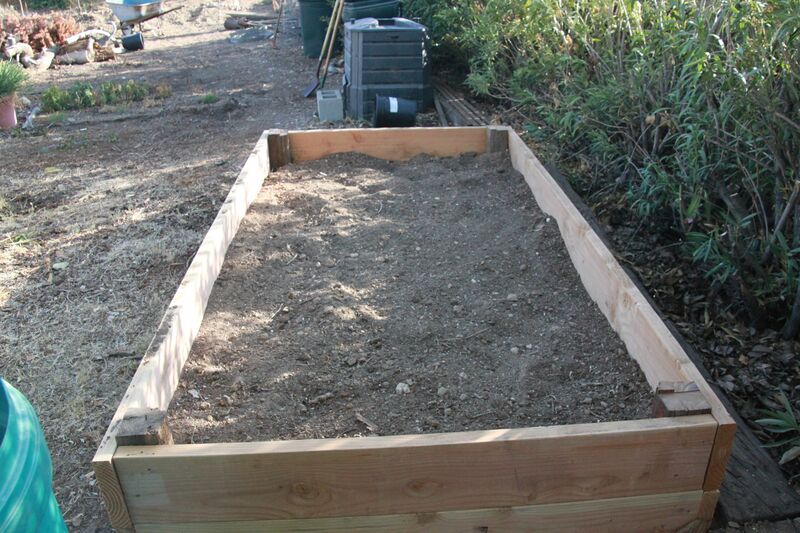 Dirt Coffin #1, 4′ x 8′ x 16″. This has all veggies planted in it. You can see the squash on the left – yeah, that didn’t work out too well, so we had to pull them out recently. The squash needed more light – they weren’t setting fruit, but they grew lush and big after being puny in the regular back yard. 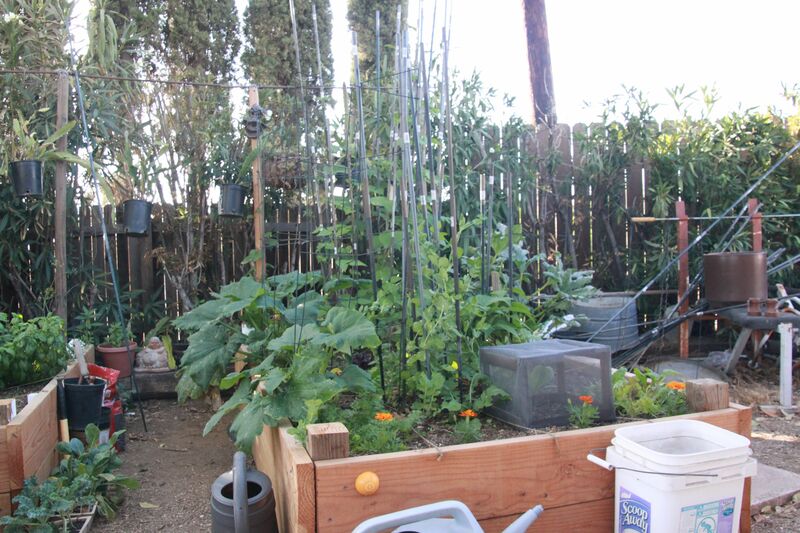 Hubby also built netting cages, to keep the birds and the grasshoppers from eating the tender lettuces. The left side of this planter faces north; all of the climbers should have been planted along that left side. Live and learn! 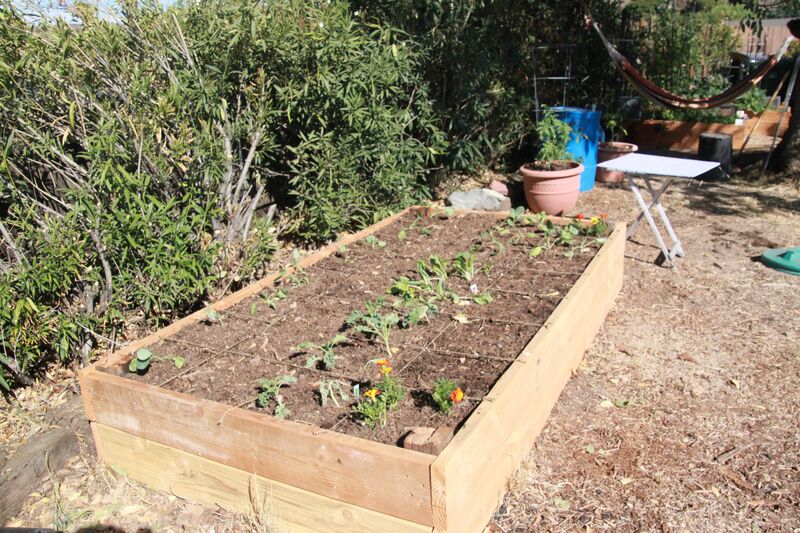 We have several types of lettuce, spinach, bush beans, pole beans (at the back), and sugar snap peas growing in this bed. 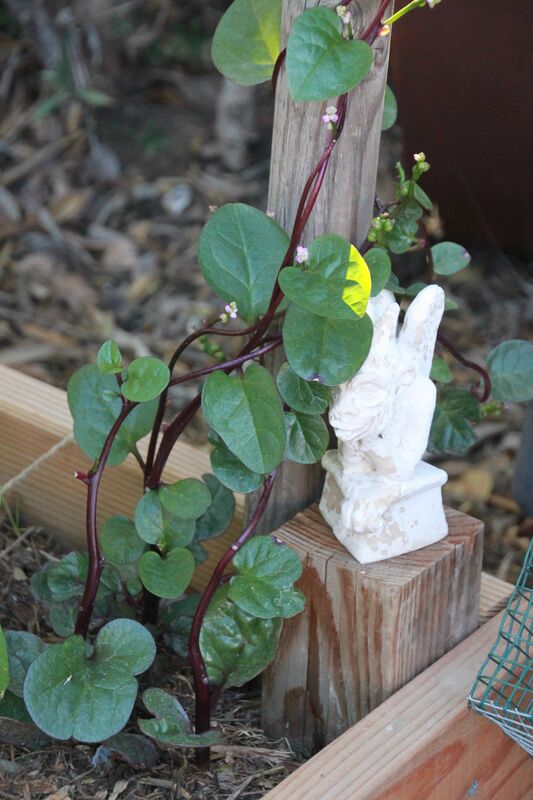 We also have Malabar Red (or Asian) Spinach – yes, that’s spinach! It’s thicker, and has a completely different taste. Works great in salads, grows fast, and has pretty pink flowers. Dirt Coffin No. 2 is our herb bed. Here, we have a row of basil (that almost died before we transplanted it – we weren’t sure it would make it); in front of it, you can see the thyme. Behind it to the right, the first two squares are Mexican tarragon (which I LOVE!!! 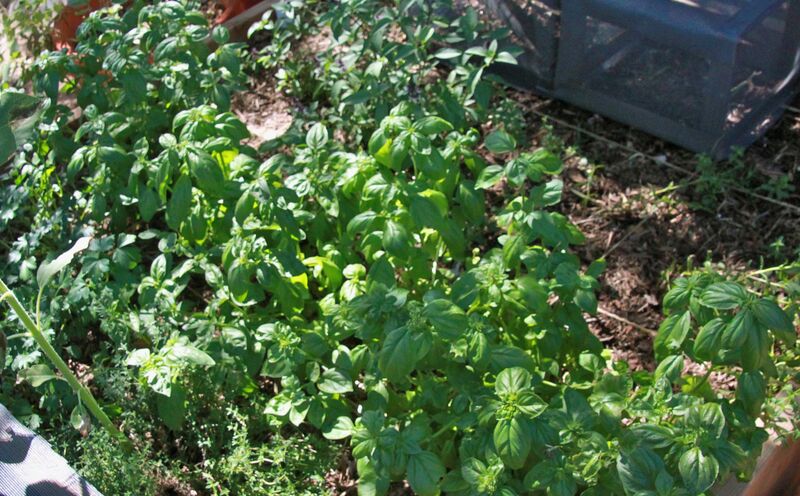 ), the other two are Thai Basil. Behind them, the two middle squares at the far right is anise, and the two on either side is fennel. 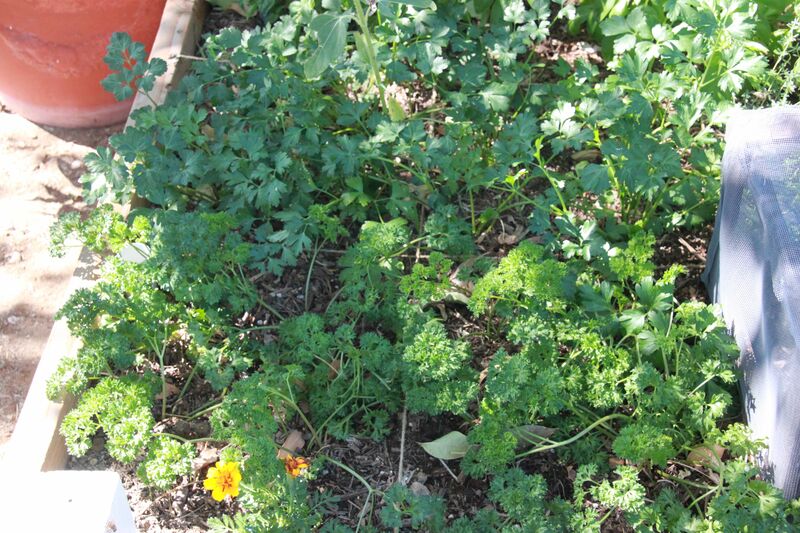 Here, you can see curled parsley in front and Italian parsley behind. 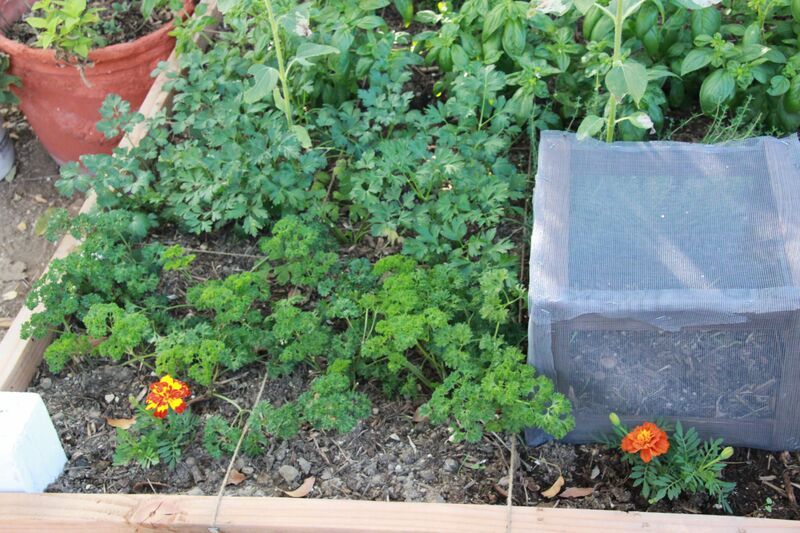 Marigolds tend to keep bugs away, so each bed has marigolds planted. Here’s the parsley a month later – it’s gotten so big! 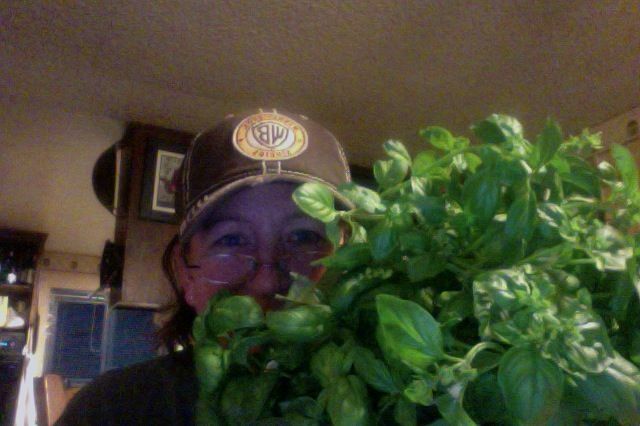 This is the basil I picked last night in order to make pesto. 2.5 cups, put into 4 oz jars and stashed in the freezer. When I went outside this afternoon, the basil looks like I haven’t touched it. So I’m guessing more pesto will be made. If you’re local, you just might end up with a jar! So what my hubby and I learned, is that where you plant, as well as what type of soil you plant in, is very important. We’re finally finding the right home for everything. 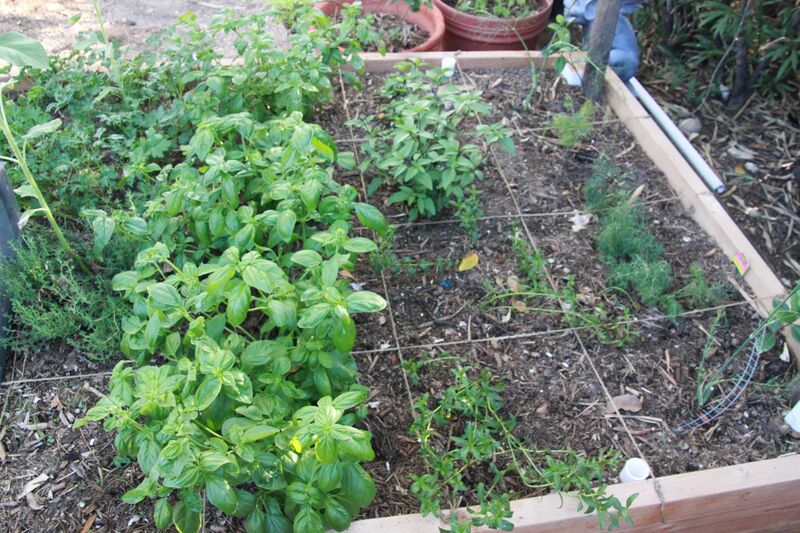 Vegetables and herbs need the soil loose enough, so the roots can grow deep enough and the plants tall enough. If all we get is our fresh herbs and salad greens from these beds, we’ll both be very happy. Planter #4 will have potatoes in it, and not sure what else. Maybe cauliflower, and beets, when they come into the stores. Still keeping my eyes open. So, this is where my hubby’s energies go when he’s not learning lines or songs or working in the tv/film industry. I dabble here…and I love it. Happy Monday, my friends. May this transition time from one season to the next be good for you. This entry was posted in My Garden and tagged basil, Christine Ashworth, herbs, malabar red spinach, pesto, raised beds, Tom Ashworth. Bookmark the permalink. Once the pods are built, it’s easy – but until the dirt is inside, it’s all sweat…don’t plant basil until spring, at this point. When (if) the weather cools down, the basil will just die. Hugs, Sam!